THE 2009/10 cricket season has been and gone, and after a promising start before Christmas we struggled as a club to get many more wins on the board. With only the second division making the finals it was a disappointing end to the season, but something we hope to build on for the 2010/11 season. Our trophy night was held recently at the Derwent Tavern, our major sponsor. It was very well attended with 85 people coming along to enjoy the night. 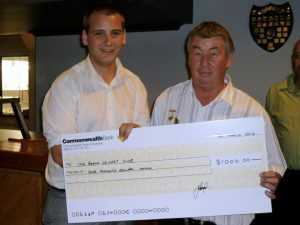 Ivan Jozeljic, left, OBCC member and Commonwealth Bank employee presents OBCC Treasurer Garry Faulks with a $1000 grant cheque at the Club’s annual dinner. The major winners in each division this season were, club champion: Chris Hobson, division 2 player of the season: Ben McGuinness, division 3 player of the season: Luke Faulks, and division 4 player of the season: Ivan Jozeljic. Adrian Bannister who was awarded life membership on the night, has played at the club since 1995 and has always been a good clubman and was well deserving of the award. We had a major influx of players from around the municipality, which was great for the club, as well as strong growth in our junior playing ranks. The more players we have playing from the local municipality the more viable we will be in the future and the stronger we will get for many years to come. A special thanks to everyone from the community who came along and watched our home games and supported our teams. Old Beach may not have always been winning, and sometimes we may even have been taught a cricket lesson, but we were always out there trying our best and enjoying playing the game of cricket. All those who played on the lush, green cricket ground at Cloak Oval after Christmas would like to thank the Brighton Council for the new sprinkler system and the support it has given us throughout the season. We have opened up all coaching positions for the coming season and advertised in recent weeks. If anyone is interested in applying for a position or has any questions about the coming season please contact the club by email at oldbeachcc@bigpond.com.